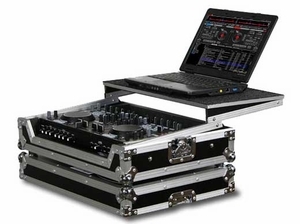 The Flight Ready� FRGSDNMC6000 case features our patented Glide Style� laptop platform and is designed with enough room underneath the controller to store cables and other essentials. Other features include a front removable panel for easy access to the front input jacks, rubber feat, ball corners, and heavy-duty recessed handle and latches. Black Label� version (FRGSDNMC6000BL) also available. Features: � Patented Gliding Laptop Platform � Removable V-cut� Front Access Panel � Heavy-Duty Ball Corners � Recessed Handle and Latches � Plenty of Cable Management Underneath & Behind the Controller � Limited Lifetime Warranty � Controller Compartment is: 18.375" x 10.25"